Cybils nominations start tomorrow - share your favorites! The Cybils awards are given each year by bloggers for the year's best children's and young adult titles. Nominations for the 2012 Cybils open just after the stroke of midnight (Pacific time) as Sunday turns into Monday. Anyone can nominate and it's a really great thing to do. I'd love to encourage more families and kids to nominate their favorite books. Anyone may nominate one book per genre between October 1st - 15th. This year, the Cybils organizers have tried to make the form mobile-friendly - from my beta testing, it works great! Sheila Ruth did amazing things creating this nomination form. Do you have favorites that immediately come to mind? I was just going over with my students the books they've read since the beginning of the year - it's such a great thing to do. Take a moment and reflect on all the reading you and your children have done this past year. Do any new books stand out? Nominate them! What books are eligible for this contest? Any English or bilingual books published in the U.S. or Canada between the end of one contest and start of another. For 2012, that means books released between Oct. 16, 2011 and Oct. 15, 2012. Books must be specifically published for the children’s or young adult market. Nominations run from October 1st to 15th for the public. Publishers have been asked to wait until after that to nominate any books that might have been overlooked. So head over to the Cybils site starting Monday, October 1st and nominate your favorite book that's been published in the past year. Full disclosure: I am the Chair of the Book Apps Cybils Committee. I love this award and have been honored to be part of this organization. It's run by a dedicated group of volunteers who write blogs about children's and YA books. 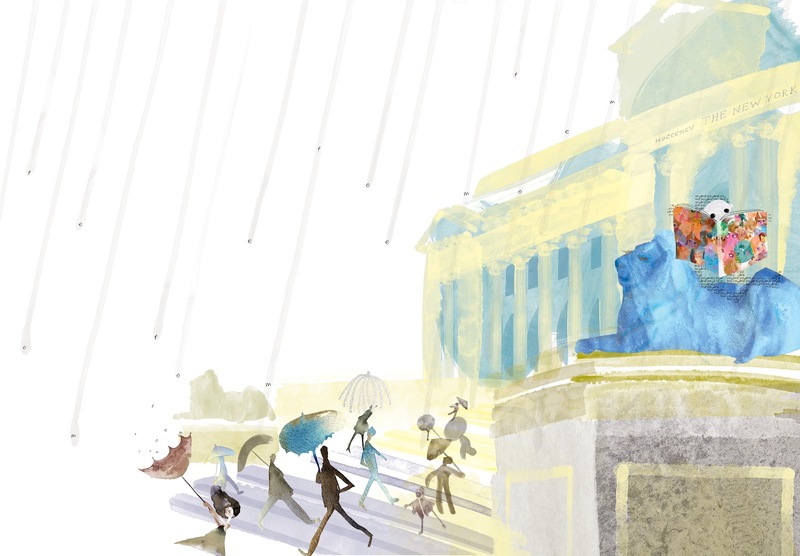 As Walter Dean Myers writes in his introduction to this wonderful picture book, writing poetry can help you see the world through fresh eyes. Young poets notice small details, listen to the world around them more intently and let their imaginations soar. 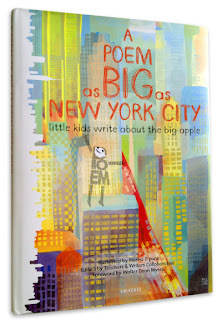 Written by children across New York City, A Poem as BIG as New York City is a collaborative book in the truest sense of the word. The voices within it shine through to make a symphony of their words, images and details. I'm especially happy to share this book today as I'm here in New York City gathering together with book loving friends at the 6th annual Kidlitosphere Conference - a wonderful event for children's book bloggers. I'm looking forward to seeing old friends and meeting new ones! 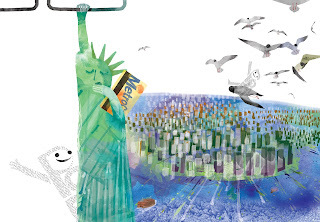 Throughout 2008 and 2009, artists and teachers working with the Teachers Writers Collaborative led poetry workshops encouraging school children to capture a sense of the life in New York City, to notice the details, sounds and images around them. Their poems were collected and edited into a single poem. I was truly amazed by this book. You can hear the multitude of individual voices coming together as one. As teaching artist Melanie Maria Goodreaux writes in her introduction, "one child's line from Brooklyn now rhymes with another's from the Bronx. 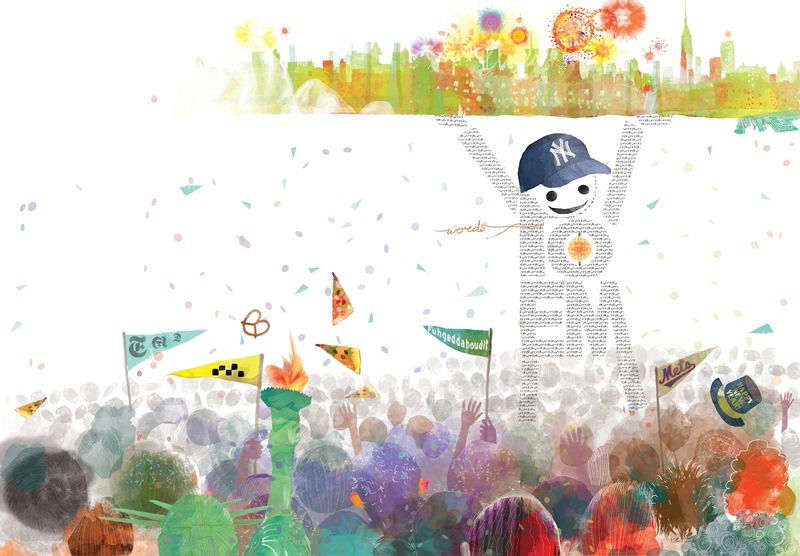 The child from Queens creates the poetic beat that bounces off the rhythm of children in Staten Island and Manhattan." as big as a tree? your tablet is really a MetroCard!" The poem truly does become a character of its own through Masha D'yans playful illustrations. Above, can you see the poem peeking out from behind the Statue of Liberty or riding through the sky on a seagull's wings? D'yans uses a soft palette to emphasize the children's visions. This is not a harsh New York, but one full of sound and energy and children's voices. Throughout, the artwork complements the images of the poetry, adding humor and color without ever dominating the children's poetry. I cannot wait to share this with teachers at my school in Berkeley, California. The poem is both inspiring and accessible, calling for children to think about the place they call home. I can just see a class working together to create a collaborative poem describing the Bay Area. I think students everywhere will be moved by the creativity of these children. To learn more about this, head over to the Teachers and Writers Collaborative website, where they share more poems, lesson plans and events celebrating this book. Also see the review by Jeff at NC Teacher Stuff. It's fascinating - Jeff's tagged this as to use with young students in kindergarten through 2nd grade, while I can see using it with 3rd and 4th graders. It just points to the wide appeal. Do you love sharing poetry with kids? Head over to Paper Tigers for more Poetry Friday posts. All images shared above are copyright ©Masha D'yans, 2012 shared with permission by the publisher. The review copy was kindly sent by the publisher, Universe Publishing, an imprint of Rizolli International Publications. If you make a purchase using the Amazon links on this site, a small portion goes to Great Kid Books (at no cost to you!). Thank you for your support. As you all know, I love writing my blog, sharing what I've been reading and recommending to students. Unfortunately, I am juggling too many commitments right now and need to take a brief break. My body is rebelling, my neck is on fire and my energy has disappeared. I will definitely keep sharing my love of books. I just have to take a brief break for now. Thank you so much for understanding. Rocket is an utterly adorable little dog that makes me smile every time I see him. 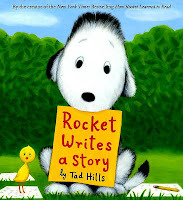 Rocket Writes a Story is the sequel to one of my favorite school stories: Rocket Learns to Read. In this new book, Tad Hills creates a story that celebrates friendship, perseverance and the joy of creating your own story. He brings a sweetness and warmth to Rocket that is comforting without being overly-sweet. 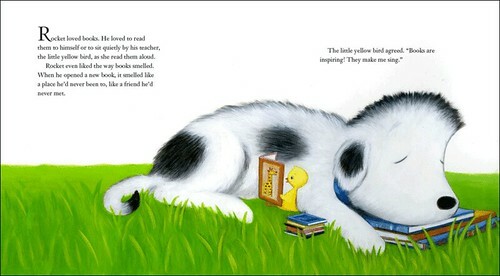 Rocket has always loved listening to stories, and now that he can read he absolutely loves books. "Rocket even liked the way books smelled. When he opened a new book, it smelled like a place he'd never been to, like a friend he'd never met." Talk about an opening that melts my heart! Every day, Rocket goes off looking for new words. He collects words, brings them back, and adds them to his word tree - with the help of his faithful teacher, the little yellow bird. Rocket is excited to use all of his new words to write a story, finding inspiration in a shy little owl perched atop a tall pine tree. Rocket works hard on his story, wagging his tail when it's going well, growling when he's frustrated. Hills does not rush the pacing, showing that stories take time and effort to develop. 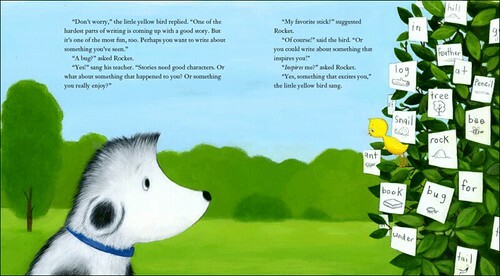 But best of all, he shows how much the little owl wants to hear Rocket's story. Reading this with a small group of beginning readers in 1st grade, they loved spotting words they could read on Rocket's word tree and in his story. Hills' picture support and choice of words perfectly supported and encouraged these new readers. They loved spotting the early pictures of owl peaking out of her nest, guessing that Rocket would discover the bird atop the tree. And they could easily identify with Rockets frustrations and excitement. Rockets stories are perfect to share with young 5 and 6 year olds just beginning the journey learning how to read and write. They love Tad Hills' gentle tone, the little yellow bird's warm support and encouragement, and Rocket's enthusiasm for learning. I especially enjoyed reading Julie Danielson's interview with Tad Hills on the Kirkus Reviews Blog and then her followup post on Seven Impossible Things Before Breakfast. Find other reviews of Rocket Writes a Story at Jen Robinson's Book Page and Tasha Saecker's Waking Brain Cells. The pictures are shared through Schwartz & Wade's Flickr stream; all are copyright ©Tad Hills, 2012. The review copy was kindly sent by the publisher, Schwartz & Wade, an imprint of Random House Children's Books. If you make a purchase using the Amazon links on this site, a small portion goes to Great Kid Books (at no cost to you!). Thank you for your support. Some times when I finish a book, I feel like I've been on a journey with the characters. Just today, when I finished Dear Blue Sky by Mary Sullivan, I felt like I'd traveled with Cassie through a hard period in her life - and felt what it was like to come out okay. Not perfect, but knowing that I could be strong enough to keep going. 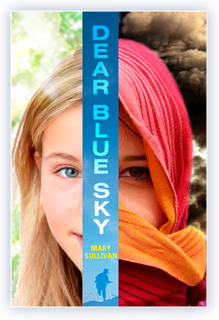 I'm definitely looking forward to sharing Dear Blue Sky with my students this fall. You never really understand how much you need someone until they're gone. That's what Cassie realizes when her older brother Sef leaves for Iraq to serve in the Marines. "I didn't even realize how much Sef held us together until he was gone. He was the only one who could make Van smile. He was Jack's hero and Dad's best budy. He was the only one Mom listened to when she'd had too much to drink. And me, I was myself with Sef." When Sef does leave, Cassie's whole family has to figure out how they'll cope. Sullivan paints a complex portrait of this family in crisis. Tweens will appreciate the way she dives into the difficulties Cassie faces, protecting her little brother, connecting to her older sister and insisting that their mother come out of her grief to notice the children she still had at home. Sullivan doesn't shy away from tough issues. "The day America started bombing Baghdad was the day the sky turned gray. The electricity go out for hours at a time and all is dark much of a day. The explosions and helicopters are more loud in the dark. When I remember old Iraq I think of light and blue sky, the color it used to be. So you understand my name now. In my past I went to school and parties and swimming. I do nothing now and I am tired. What I want? I want my family to live. I try to have hope but it is difficult. I wish to have my spirit back. I wish to be a bird and fly high away. Except the sky is full with smoke and bombs." I was particularly impressed with how Sullivan raises these complex issues in a way that tweens will understand - personalizing the impact of the suffering caused by the Iraq War, focusing in on family and friendship dynamics, looking closely at the impact of assumptions and isolation. At the end, I felt like I had truly been on a journey with Cassie, growing with her in my understanding and compassion. Through it all, Cassie becomes closer with both her sister Van and her friends, but she also becomes stronger and more centered in who she really is. "Mary Sullivan takes complex subjects—war, loyalty, bullying, friendship—and honors their complexity in lucid, fast-paced, effortless-seeming prose. Her young narrator, Cass, comes to understand that love is not easy, nor, in itself, is it enough to set the world right. But she also learns that love is often closer than it seems, and that the ability to recognize its presence is a vital gift. 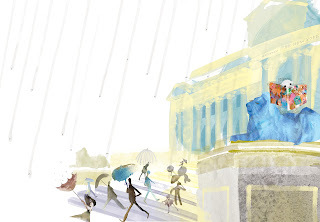 Full of questions and full of warmth, Dear Blue Sky allows readers to engage with big ideas in a wonderfully accessible way; even more generous, it allows us to think for ourselves." For other reviews, check out the New York Times review and Kirkus Reviews. The review copy was kindly sent by the publisher, Nancy Paulsen Books, an imprint of Penguin. If you make a purchase using the Amazon links on this site, a small portion goes to Great Kid Books (at no cost to you!). Thank you for your support. September is a month of changes. Children have grown over the summer, learned new skills and made new friends. Now they are meeting new teachers, learning new routines and getting ready for the new challenges ahead. It’s a perfect time to share a favorite author, Rosemary Wells, who has written more than 150 books for youngsters and captures the world of young children in the midst of these big changes, starting school and making friends. This is one of my favorite books to share at this time of year. Emily is an eager, enthusiastic bunny. Miss Cribbage tells her new students they will “make a new number friend” every day for the next hundred days, at the end of which they will have a big party. Rosemary Wells shows different aspects of Emily’s life in school and at home, introducing one number at a time, expanding this beyond a simple counting book. Young listeners will relate to Emily’s excitement picking a dozen roses for her mother, reading 17 words in a story and collecting 25 beetles from the school garden. Soon, Emily writes a letter to her parents celebrating the 100th day of school and all the things she has learned, sealed with 100 kisses. 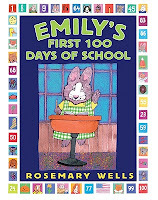 Emily's First 100 Days of School from Rosemary Wells on Vimeo. This is the perfect book for starting the new school year, celebrating the joy in discovering new strengths and wonders. For more of favorite Rosemary Wells picture books, check out my monthly bookshelf column over at Parents Press. Raina Telgemeier creates fantastic graphic novels for tweens, most notably the hugely popular Smile and the graphic adaptations of the Babysitter's Club. 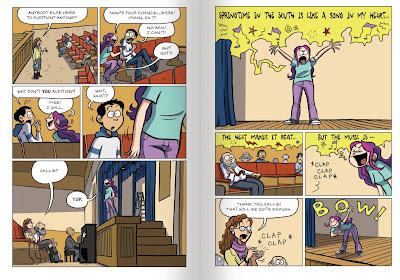 This month, we are super-excited to share Drama - her newest graphic novel. Mary Ann & kids: Kids are always curious - how much of your books are based on your real life? Were you ever in a drama club? Raina: It depends on the book, but I draw a lot of inspiration from my real life! Smile is about 95% “true”: there were some name changes, and a few cases where I condensed time or place to serve the story better. Drama is, I would say, about 50% “true”: I was involved in after school drama in middle school, and musical theater in high school, and some of the characters are inspired by people I know…but they are still characters. With Smile, I let my past events drive the story. With Drama, I was able to steer it wherever I wanted. Mary Ann & kids: At the end of Smile, you write: “I realized that I had been letting the way I looked on the outside affect how I felt on the inside. But the more I focused on my interests, the more it brought out things I liked about myself. And that affected the way other people saw me!” (pp. 206-7) How does this relate to Callie’s story in Drama? Raina: Callie’s more interested in enjoying her geeky pursuits than worrying about what people think of her. Maybe that makes her an uncommonly mature middle schooler, or maybe she’s just in her own little world. But she is very passionate, and knows her own strengths and weaknesses well enough to focus on what works. I wish I had been more like Callie when I was in middle school! Mary Ann & kids: Why did you decide to make Callie’s two friends gay? Kids have liked this part of Drama, but are curious why you decided to make it an important part of the story. Raina: Jesse and Justin are very much inspired by two good friends of mine, who also happen to be incredibly talented, good-looking, inspiring, and yes, gay, twin brothers! These two characters, and their relationship with Callie, are the truest part of the story—I still have a wonderful bond with my two friends, and I wanted to honor them in Drama. Telling this story in any other way was never an option; it was always, at its core, about these three characters and their friendship. Mary Ann & kids: What parts of the creative process come really quickly for you? What parts are harder? Why? Raina: Writing is the hardest! Whether I’m working with my own memories or crafting stories from my imagination, it’s kind of like doing a really difficult word search. You’re staring at all the letters, trying to make sense of them, waiting to see patterns in what looks like a big jumble. When you finally see those words, it’s as if they were always there! But that process can take months. Even years. The drawing comes more easily. I do my ‘writing’ in thumbnail format, which means that the words and pictures in each panel are coming to me and I am jotting them down at the same time, so when I’ve completed a script, I have a rough draft of the words and the page layouts. From there, I can interpret the rough, scribbly art into something nicer to look at, and from that point on it’s very fun. Tiring for my drawing hand, but fun. Mary Ann & kids: You’ve laughed at times that kids will read your stories in an hour, when it takes you years to write a graphic novel. But I’ve seen kids reading Smile again and again and again. Why do you think kids reread graphic novels in this way - what draw kids back to them time and again? Raina: I had the same experience with my Calvin and Hobbes and For Better or For Worse collections, reading them over and over to absorb everything. The first time around, I think it’s the story and the jokes readers respond to. Then, it’s the artwork. After that, it becomes more subtle, but it’s still very powerful: I carefully studied the pacing and setup of comic writing, the beats and the rhythms. The body language of the characters. Their faces. Each of these elements can stand on their own, even though they add up to a quick, easy reading experience when combined. Do you want to learn more about Raina? Head over to her website GoRaina.com and explore all that she has to offer! Definitely head out to see her as she visits bookstores and schools across the US this fall. She'll be in the San Francisco Bay Area this month. All of her bookstore signings are listed right on GoRaina.com.